We deliver training at various locations as well as being able to offer training at the client's premises if this is appropriate, anywhere in the country. We pride ourselves on the fact that we research our client’s business to ensure that the training that we deliver is specifically designed with the client’s needs in mind. 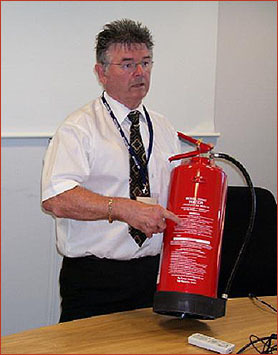 Our consultants and trainers all come from a fire service background, many of whom have served as high-ranking officers with brigades throughout the country, having been involved in fire safety inspections and fire training for many years, holding appropriate business management and fire related qualifications that enable us to ensure the correct level of fire safety training, working with our clients to ensure that this is complimentary to the running of their business.